In the comments to my earlier post today, several commenters mentioned module X10, Red Arrow, Black Shield, which deals with a "world war" in the Known World instigated by Hosadus, the Black Master of Hule. I'll talk at greater length about X10 in a future retrospective, but, for now, I wanted to post two scans of artwork included in the module. 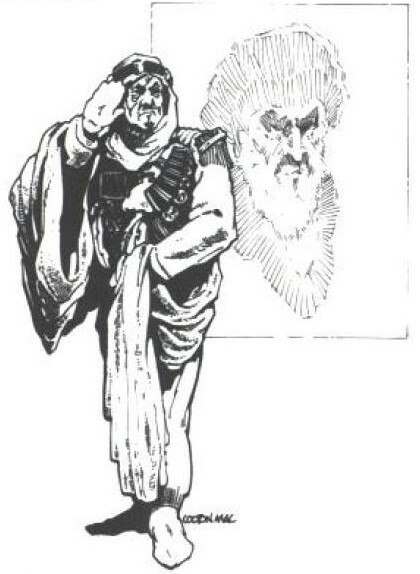 These pieces both depict Hosadus, first in person, and then on what appears to be a propaganda poster behind his second-in-command, the wizard Alrethus. 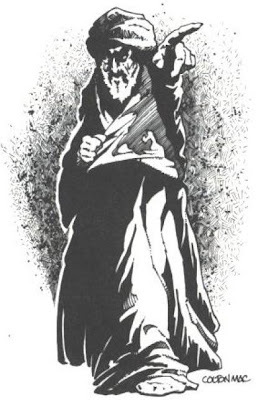 Both of these illustrations bear out my earlier feeling that Hule was modeled on revolutionary Iran, with Hosadus playing the role of the Ayatollah Khomeini. I find this interesting for a couple of reasons. Firstly, module X10 was published in 1985, so it's not as if it's hot on the heels of the 1979-1981 Hostage Crisis. Secondly, Red Arrow, Black Shield is notable for having almost no original art in it at all. These two pieces are among the only original illustrations in its 64 pages, the rest being either recycled from earlier products (like the cover, which clearly depicts draconians from the Dragonlance series) or what appears to be public domain images. Again, that says a lot about the state of things at TSR at the time. Finally, I think this may be the only time in the history of TSR up to that point when a fictional character was so clearly shown as being based on a real world individual and negatively so. This puts the infamous TSR Code of Ethics of later years into an interesting light, since, as I recall, at least one version of it forbade the very thing X10 seems to have done. "module X10 was published in 1985, so it's not as if it's hot on the heels of the 1979-1981 Hostage Crisis." I dunno. That's only about 4 or 5 years. Khomeini was still pop culture fodder well into the late 80s. "Back to The Future 2" features him in a bizarre cameo. How interesting. I don't own X10, so never knew this. Fitting model, though. Agree with Dave G... Khomeini was part of the top-3 evil bogeymen throughout the 80's, as I recall (until his death in 1989). Compare also to The Iron Sheik's act in the WWF 1983-1987 waving an Iranian flag as a bad guy (X10 being published dead center of that period). These illustrations were a big part of why I regarded X10 as a much inferior sequel to X4 and X5. Hosadus, in X5, was a mysterious figure -- it was up to the DM to fill in his motivations and personality. The country of Hule was likewise lightly sketched -- clearly sinister and oppressive, but undefined enough to range from Stalinist dictatorship or the isle of The Wicker Man. These illustrations made it a cheap joke. These illustrations made it a cheap joke. Yeah, I don't particularly like their inclusion either. They don't feel right in a TSR product like this and I have to wonder why, of the few pieces of new art we get in X10, they decided to go with these. The Known World was based on Eurasia and the western half of it, especially, was based on northwestern Europe: the Low Countries and northern Italy mainly, with a touch of republicanism in Darokin. The "Desert Nomads" were analogous to Arabs. Whoever was uniting the nomads had to be something a European would understand. X5 made the big reveal that the Master of the Nomads was the theocrat of Hule. So, like it or not, a Persian analogy was where the series was headed. Whether X10 did it right, and I agree that it was edited badly, is a separate question. Yeah, TSR knew what it was doing. Hule = aggressive post-Islamic Persia under a cult of personality. 1980s Iran, in short.